Reports feature on HappyFox Chat provides data on the chat activity and customer satisfaction metrics. Reports feature is available in Mighty and above plans. Reports can be accessed by both admins and agents. Only admin can export the reports data. 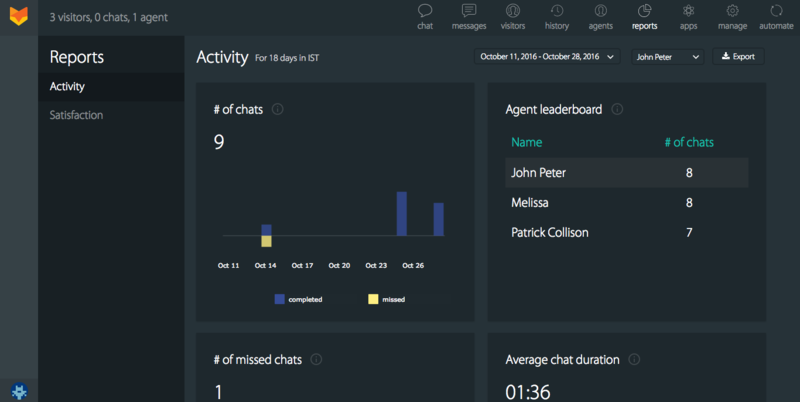 This section displays data on total number of chats over the selected time range in pictorial form, number of missed chats, agent leaderboard and average chat duration. a) Custom Date Range Filter - Allows you to filter reports based on custom date range that you select in the drop down. 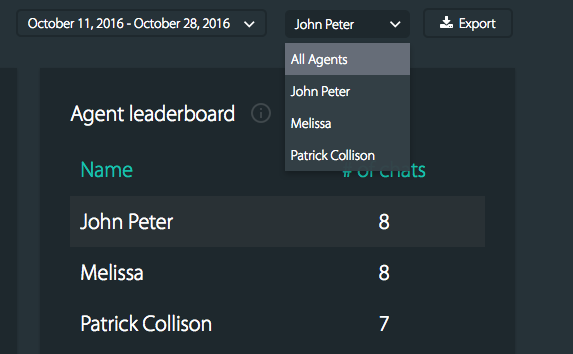 b) Agents Based Filter - Allows you to filter reports based on agent to know agent level performance and metrics. c) Profile filter - Allows you to view reports for the selected profile. d) Department filter - Allows you to view reports for the selected department. 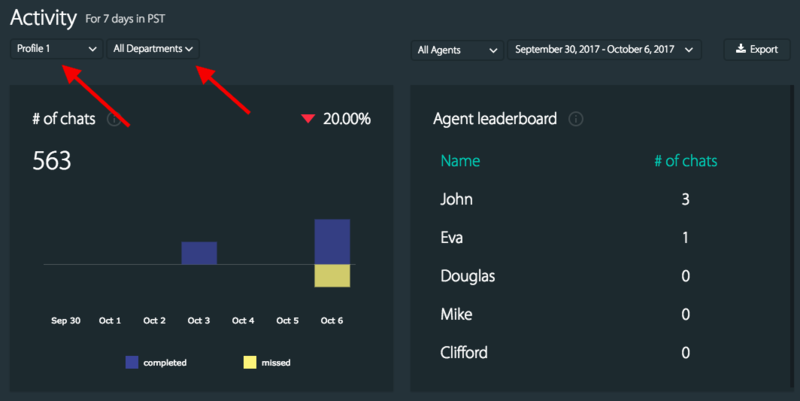 This section displays data on customer ratings, average first response time, average waiting time and agent leaderboard. Admins of the HappyFox Chat account can export the chat reports data in a CSV format. After selecting the filter range, click 'Export' button located on the top right corner of the Reports section. Once you click, reports will be mailed to the email id of the admin who requested it. Profile Name, Date and Time, Visitor Page URL, Visitor Timezone, Visitor IP address, Visitor Name, Visitor Email address, Agent Name, No of Messages, Waiting Time, Average Response time, Total Duration of Chat, Missed Chat, Chat Rating, Tags associated with the chat transcript, Phone no. of the visitor, Triggered chat name and Triggered chat message. All these field information are available for each and every chat with the visitor over the selected range.